There are multiple reasons why campaigns trying to use D&D for heroic fantasy gaming go south, and shrooms are one of them. Namely, D&D’s oddball monsters – man-eating pudding, giant slugs, hyper-intelligent floating beachballs which are both magical and anti-magical, and plain old mould – do not exactly conjure images of valiant struggles and derring-do. They are horrible, funny, and often both. Dying because you cut open an exploding puffball mushroom and coughed up your lungs is not exactly the stuff of legends, but it is sure a memorable way to go. Shroom monsters are D&D to the core. 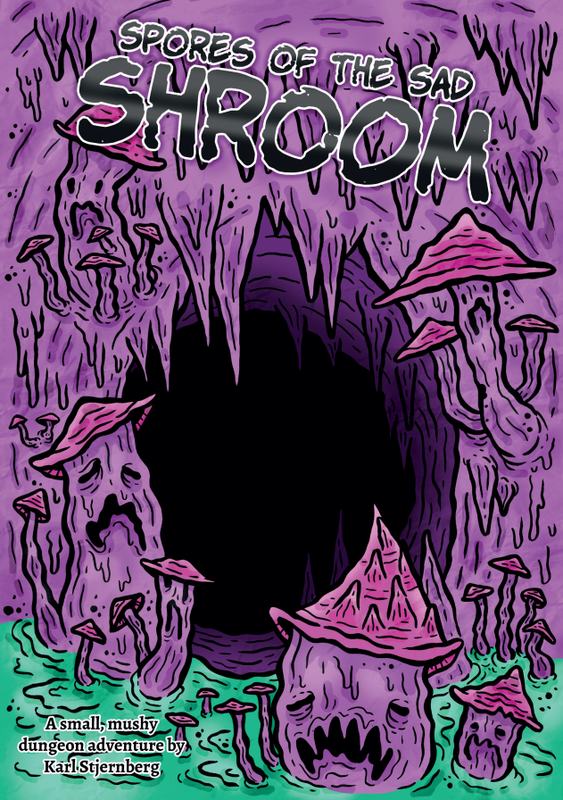 Not surprisingly, fungus master Erol Otus is a legend in old-school circles, and Pod-Caverns of the Sinister Shroom is one of the best-known old-school modules (not to mention Demonspore and other trips into mushroom-rich environments). 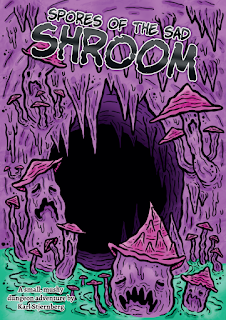 Spores of the Sad Shroom is a 16-page mini-module featuring some of the most fungal ideas explored in old-school. It is one of the cases where the artwork, which takes up a great deal of the content, does a lot of heavy lifting. This rare time, it works, perhaps because it adds to the text in cool ways. By a rough estimate, 9 of those 16 pages are laden with squiggly line art, conveying a sense of grotesque whimsy (there are repetitions). This continues in the adventure text, which involves descending into a fungal realm beset by a strange problem. It is not a straightforward hackfest (although there is that, too), and all the encounters have some kind of odd twist to them. It has that hallucinogenic quality you’d expect of a mushroom-themed module, and it never becomes one-note. Last but not least, it is funny. There is a great what-the-hell-did-we-just-see feeling through the whole thing. The adventure is just on the right side of minimalism. The writing is a good example of terse and expressive prose. It doesn’t waste words but it is not stripped down to the core. However, it is small. It is a small, small module, and efforts have been made to make it more complex and layered, but it is just small. The map is basically a few side-branches attached to a single loop (a blank extra level is provided for the GM). It is 11 good encounters and some depth through the random encounters and the extra layer of interacting with insane mushrooms, and the artwork is super-cool, but it feels hemmed in. This feels a bit unjust, because the module never pretends to be more than what it is, but the feeling is there. I guess it is good enough to make you crave more of it, but this is followed by the slight disappointment of that ‘more’ not being there? This adventure has been playtested by “Christ Didonna & Gang”. A good start, but don’t the gang also merit a listing?